Yes, you heard it right. You can get your Credit Score (generally referred as CIBIL score) for free from Credit Information Companies(CICs). The Reserve Bank of India (RBI) in September 2016 had mandated every Credit Information Company (CIC) in the country to give one Free Full Credit Report (FFCR) to every individual starting from 1st January 2017. This detailed report mainly carries the Credit Score, among other things financial points. Due to this mandate, you can now check your CIBIL score for free once in a year. Many people are finding it hard to know how to check CIBIL score online for free. So here I am to help you out with this my latest post. Individuals can get this credit report/credit score once a year between January and December from one of the three CICs, i.e., Experian, Equifax, and the CIBIL TransUnion. All these CIC’s maintain your detailed records of your credit card bills and any current or previous loans. However, the scores could be different for these CICs as they have their own set of methodology or rules. Also, processes for applying to these companies are different. The Credit Score is a number that indicates an individual’s credit worthiness. It impacts the individual’s capability to borrow and take new credit from lenders. Usually, banks or lenders use this credit score to evaluate the probability of whether an individual repay his debts or not. A credit score is a summary of the credit report, which catches in depth an individual’s credit history, both from the past as well as current. This information includes all the history of credit cards, a number of accounts held, various loans (personal, vehicle, etc.) and the type of accounts as well. Higher your Credit Score, higher are the chances of loan approval such as personal loan, business loan, home loan, loan against property, credit cards in India. A CIBIL Score is a score or rating given to individuals as an indicator of the individual’s credit behavior. The CIBIL score range is 300 to 900 (low to high). The credit score of 750 and above is considered good and is in most cases you are seen as loan worthy. The score below 750 is a pointer of a possible underlying issue in the individual’s credit worthiness. Better Credit Score\ CIBIL score helps you get loans at much better rates from lenders. A better Credit Score also helps you get offers from multiple lenders – giving you a better deal. A unified report with all your past and current credit history. A good credit score helps borrowers to get loans easily from banks. Credit score reports form the basis of releasing loans to a borrower. An exhaustive report to help you nurture better financial discipline. Helps in staying clear of debt traps. Better score on the credit report gives leverage when negotiating interest rates. In India, three credit rating bureaus or agencies compute your score. Each of these rating agencies has various ranges for their credit scores. The most popular credit score in India is the one issued by CIBIL. This is one of the most known or trusted Credit Information Company. People generally refer Credit score as CIBIL score due to its popularity and wide use. I have given a detailed Do It Yourself (DIY) Guide on how to check CIBIL score and get a free credit report from CIBIL under next heading. The procedure to get your FFCR and score from Experian is similar to that of CIBIL. We will cover the detailed procedure in some other post. For now, just know that you can also get one free report from Equifax and Experian. How to check CIBIL score or Credit score online for free? Now that you have completely understood the importance of credit score. Also, you must be feeling happy that RBI made it mandatory to all Credit Information Companies (CIC’s) to provide one free credit report per year. 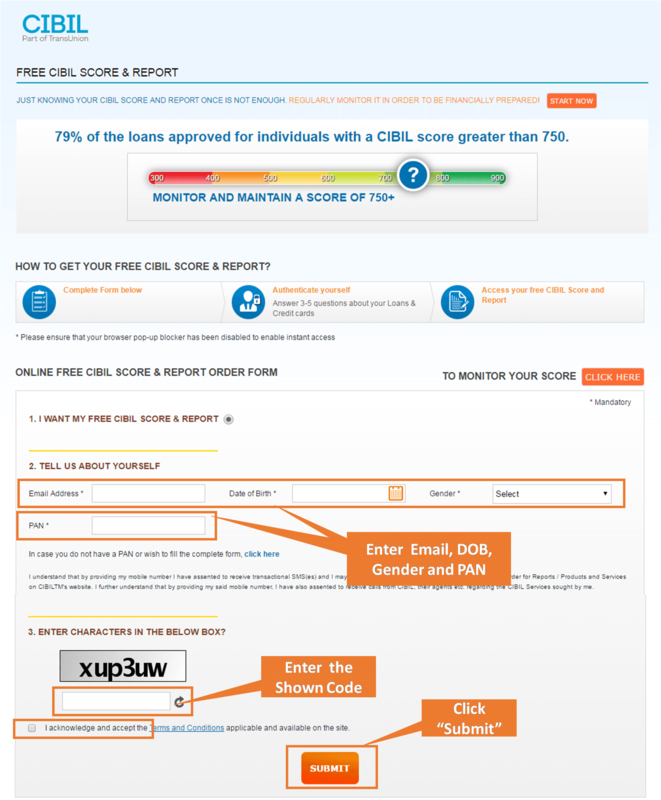 Let’s go ahead with my Do It Yourself (DIY) Guide on how to check CIBIL score\ Credit score online for free. There are three steps to getting free CIBIL score. You will get the below shown page. Here you have to give your Email Address, Date of Birth, Gender and PAN card number. Then enter characters shown in below text box. Now accept the terms and conditions and click on Submit button. Once you click on Submit button, you will get a new pop-up window as shown below. Here you have two options, either to go with paid subscription (Rs.800 for two reports and Rs.1200 for four reports) or Free (1 report per year) method. As we want to get a one-time free CIBIL score, click on “No, thanks” button. 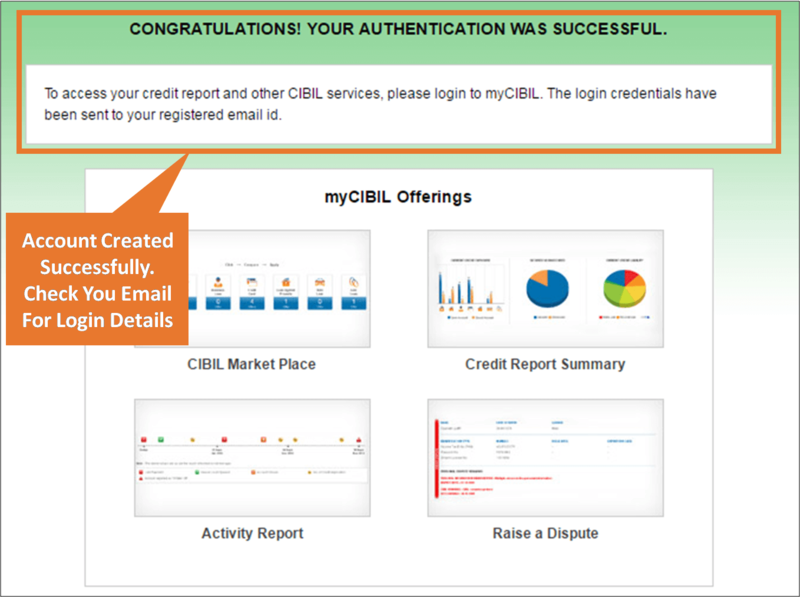 CIBIL account is created successfully; you will get a congratulation message as shown below and requesting you to login to myCIBIL by using the password provided by CIBIL. Now check your email address for the email from CIBIL as shown below. To access your report, click on the link given in the email. CIBIL also provides a one time password to access your account first time. Once you log in using these credentials, you will be asked to change your password. Enter desired password and re-login to your account once again to see your CIBIL score. 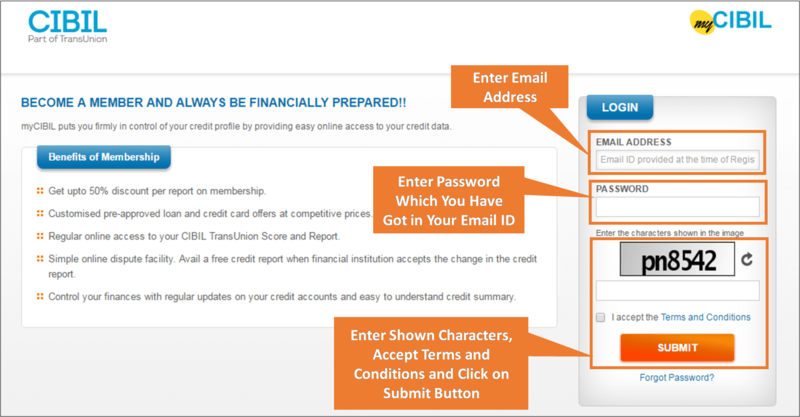 When you are logged into your account, you will get Consumer Details section. There are few fields which will be auto-populated like Name, Mailing Address, City and Pincode (shown in green color below). You need to enter your Mobile Number as it is compulsory (shown by orange color). Click on Submit button once you enter Mobile Number. 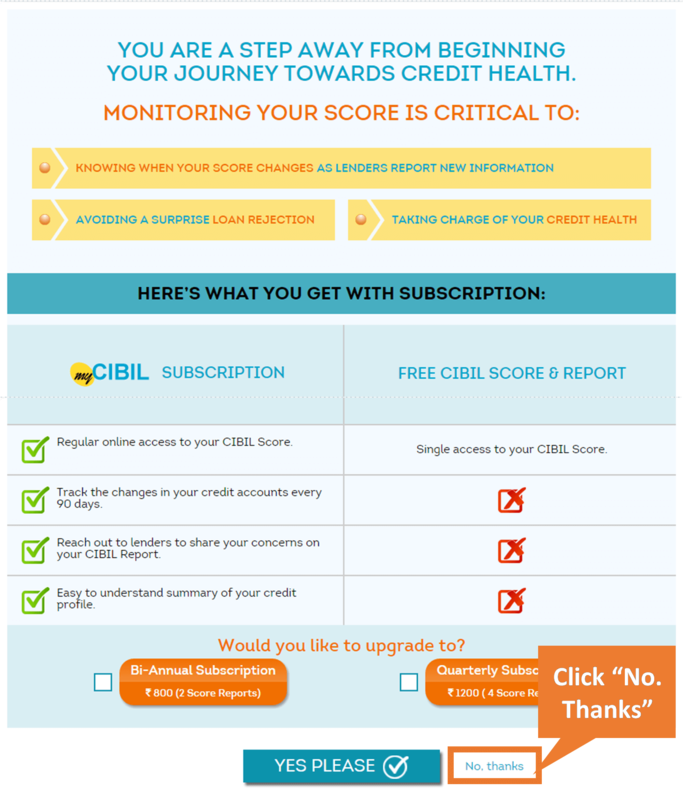 And here comes the much awaited CIBIL Score\Credit score on your account Dashboard. Here in below case, it is 799, which is a great score. Under View Report you can see personal information, contact information, Account information (existing and past credit history) and Enquiry information (list of banks who asked for your credit report). Personal Information – You can see your all personal information here. Contact Information – Here you see all your addresses that you have previously declared. Employment Information – Here your Account Type, Income (tentative), and Income Indicator, etc. are shown. Account Information – This section lists all your Credit Cards, Account Numbers, all Account Details and any dues on it. It also lists all your loans such as Personal or Car loans. You need to make sure that you have closed your unused accounts to have a healthy Credit score record. Enquiry Information – In this section, you can see who all have requested your Credit score\CIBIL score. This section also shows the Date of enquiry, Enquiry Purpose and the amount for which query was raised. What your Credit score\ CIBIL score says? Here is the detailed explanation of what your credit score says. Great – 800-900: This is a great score. It reflects an ideal track record of repayments of all your previous borrowings that means you get the great offers on various loans and credit cards. Good – 600-799: If you are planning to apply for a fresh loan or a new credit card, this score offers a good chance that your application will be granted. A score in this range shows that you have handled your previous borrowings judiciously and are a safe borrower. Bad – 300-599: This is considered as a bad (low) CIBIL score and your chances being approved for the new loans or credit card are very less in this case. Primary reason for getting this score can include the default on loan payments or missing credit card payments. Hope this Do It Yourself (DIY) guide on how to get a free full credit card\CIBIL score will be helpful to you. Share this with all your friends. Irregularity in Credit card and loan repayments. Too many unsecured loans such as credit cards and personal loans. Higher the rate of application for credit cards or unsecured loans. If you are defaulter for your friend’s loan for whom you are acted as guarantor. Using your credit cards to the full limit. Never utilize more than50-60 percent of your credit cards limit. Never default your Credit card bills or loan EMI. Pay them without fail and within a specified period. Don’t try to overburden yourself with the too many loans. If your credit score is good, then banks are ready to sanction more loan than what you asked for. In such cases limit yourself for needed amount. Avoid having many unsecured loans and credit cards on a single name. Do not forget to collect “No Due Certificate” from your banker after closing the cards accounts or loan. Have 6-9 months of a gap while applying for fresh loans. Never try to run away from your loans. Settle them as soon as possible in a friendly way with your banker. This is a great opportunity to know your CIBIL score which is essentially required for every loan or cards that you take. The free full credit report will help you identify your credit outstanding, old loans or may fling up surprises against credit cards which you had not even applied for or loans which you might not have taken. Study the report and take necessary steps to get such things rectified to ramp up your future credit score. Do let me know your comments and share this post with your friends. Thanks for the great share. Keep doing this great work. That’s a very good score. I am at 759. Looks good though having 3 credit cards. 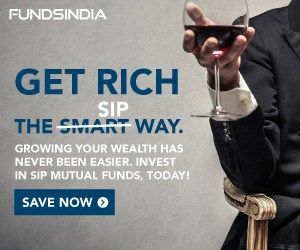 You just saved my Rs.500 by giving me guide to check it for free from CIBIL.com, so thank you so much. Keep helping. 8 months back my personal loan application was rejected by a bank. They did not disclose me the reason for it. Now I understood that my CIBIL score was low, because I have some dues on my very old credit card. I do not have that card with me. What should I do now?. Contact to your credit card provider as soon as possible and pay whatever amount is pending. Being default on such payments for a longer time can pull down your credit score rapidly. Once you close the card, you can raise a dispute in CIBIL site and they will resolve the issue after confirmation with your bank. Hello sir, This is really a great news. Thanks for sharing. I got 705 cibil score. Thanks a lot for the reply. I will process the same immediately. 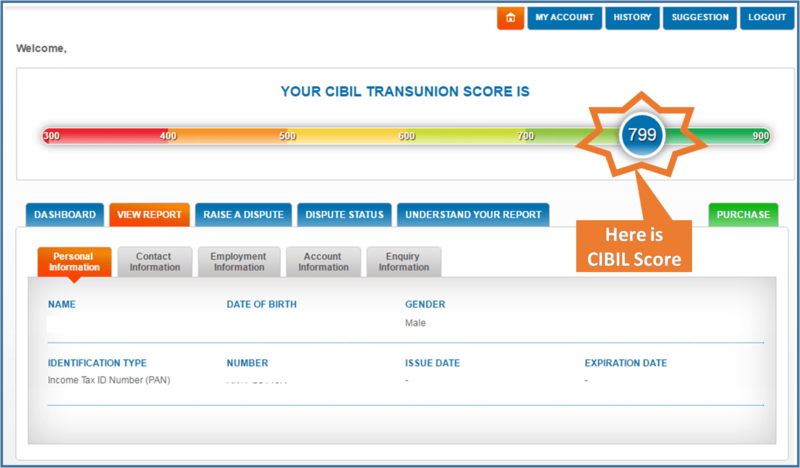 Yipee…my cibil score is 794..
678.looks like I have improve. Not very good but you can get a loan or credit card with this score. Try to improve the score by the ways I have stated in above post. Very detailed explanation regarding CIBIL score..really appreciate your work. My cibil score is 803. Thanks Suraj. I am elevated by your words. You saved our money. Good that we have guides like you. Hi B Kapadia, you have a good score. I just checked and found it 847, quite a good score. Now going to learn your investment mantra. You have a very good score. Hi Sir, Thanks for the detailed post, I checked my Cibil It’s 783 but when i checked Experian via bank bazaar site there score is 857.
so i am confused which one is correct why both are showing different values. also in Experian one of my old CC shows as active which i have an emailed communication as closed from card service provider. what next action i should take here. please guide. The data used by different credit bureaus are different, therefor you may see the differences between the score. Now to correct your issue regarding CC. Firstly you need to fill a cibil online Dispute Resolution Form. Then cibil generates a complaint ID. Sake is forwarded to your bank for correction. Generally it takes between 30-45 days to see updates in your account.